In his 17th fight as a pro, George Benton of North Philly won a unanimous 8-round decision over Holly Mims, on this day in 1952. Mims, a veteran of 35 bouts - including battles with Johnny Bratton (W10, W10), Otis Graham (W10), & Sugar Ray Robinson (L10), entered the ring as the favorite. Benton had a prior win over Jetson Arnold but was virtually unknown at the time. However, in the end, it was the underdog who won the bout before 2,152 fans at The Met. 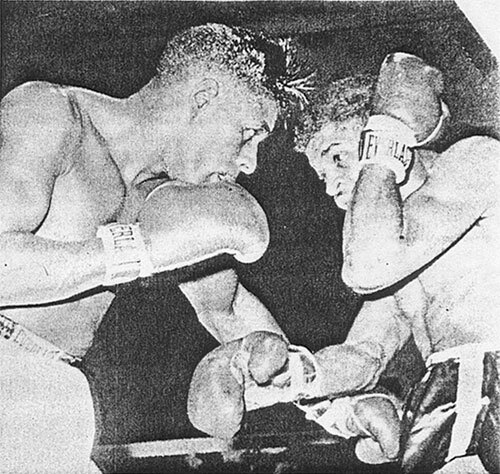 The two would fight a rematch in 1959, with Mims winning the 10-round decision. Note: the photo shown is from their second bout.